No one would argue that we live in a world of compromise. In fact, compromise is often touted as a virtue; it's diplomatic and reasonable. On the other hand, those who hold fast their integrity are viewed as difficult, hard-nosed, and unconcerned about the common good. You can understand how the world thinks that way, but shouldn't Christians be different? Unfortunately, too many believers worry about what people will think, say, or do if they take a stand on godly principles. So instead, they compromise their convictions or maintain them under the cover of darkness. If you're one of those faint-hearted Christians, or if you know people who are, I'd like to encourage you to take a lesson from the life of one man, a man with a backbone. Following his first invasion of Judah and siege of Jerusalem in 606 B. C., King Nebuchadnezzar took hostage dozens of quality Jewish youths (who were probably in their teenage years) to help ensure the success of his long-range plans for world dominance. One of those youths was especially destined for greatness, and today his name is synonymous with integrity and an uncompromising spirit. His name is Daniel. 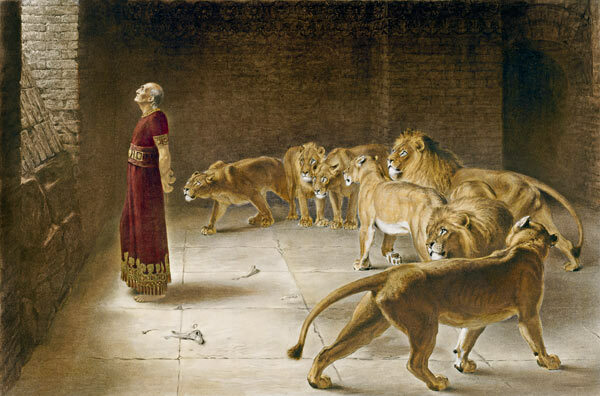 It wasn't captivity that tested Daniel's integrity, it was privilege. When the king ordered his chief official, Ashpenaz, to choose from among the Israelites, he sought youths with certain qualities. They were to be without defect, good looking, "showing intelligence in every branch of wisdom, endowed with understanding and discerning knowledge," with the ability to serve in the king's court (Dan. 1:4). They were to receive privileged instruction for privileged positions. The king ordered Ashpenaz "to teach them the literature and language of the Chaldeans" including mathematics, astronomy, natural history, agriculture, and architecture (Dan. 1:4). They were to eat the king's food and drink the king's wine, and after three years, they were to have a guaranteed position in the king's personal service. I doubt the other exiles were getting along as well. Now you say, "Privilege, education, good food and drink, one of the most sought after jobs in the kingdom--who could have a problem with that?" Daniel. Daniel didn't argue with the education, the training program, and the future in the king's court. He didn't even balk when Ashpenaz named him Belteshazzar, after a Chaldean god. Daniel drew the line where the Scripture did--he wouldn't eat the king's food or drink the king's drink. "But Daniel made up his mind that he would not defile himself with the king's choice food or with the wine which he drank" (Dan. 1:8). Those enticing morsels and vintage wines--perks of the king's service--had been ritually dedicated to Babylon's false gods. What's more, eating food prepared to Babylonian standards was likely to put the young exiles in violation of God's laws concerning unclean foods (cf. Lev. 7:23-27; Lev. 11). Daniel wanted no participation in any pagan feast, even to the slightest degree. That would be a form of idolatry that would provoke the wrath of a jealous God (Ex. 20:4-5). His decision, though immediately dealing with food and wine, was ultimately a decision about who he worshiped. Daniel's decision constitutes a basic part of genuine integrity and the uncompromising life: you must draw lines where Scripture draws them. If the truth of God's Word opposes the world's wisdom on a certain issue, you must align yourself with God's Word. The more you read about and analyze the life of Daniel, the more clearly his personal integrity comes into focus. His uncompromising lifestyle stands in sharp contrast to the way many believers live out their convictions. Many Christians tend to waver and offer ambiguous explanations for abstaining from certain secular activities. But that wasn't how Daniel approached the opportunity to state his convictions. - If Daniel wanted to abstain from eating and drinking what the king provided, he could have gone about it a number of ways. He could have thrown it away when no one was looking and sneaked other food from the kitchen; he could have made arrangements with the kitchen staff; he could have started a vegetable garden out back. But Daniel, having made up his mind, chose the route of open boldness. "He sought permission from the commander of the officials that he might not defile himself" (Dan. 1:8). He was respectful, but unbending. That's called courage. - Daniel was in a foreign country, at the very heart of the empire that had just destroyed his homeland. And yet, "God granted Daniel favor and compassion in the sight of the commander of the officials" (Dan. 1:9). He proved the truth of Proverbs 16:7: "When a man's ways are pleasing to the Lord, He makes even his enemies to be at peace with him." Don't compromise and forfeit God's protection. Stand firm in obedience to God's Word and trust Him--He'll take care of you. - In his boldness, Daniel didn't hesitate to go right to the top. But when Ashpenaz feared the forfeiture of his head for granting the special menu, Daniel was undeterred. He appealed to a lower-ranking overseer who monitored him-presumably a man who would not be as afraid of Nebuchadnezzar since he didn't report directly to the king. Daniel showed another vital trait of integrity: persistence in doing what is right. - When Daniel sought permission to go on a water and vegetable diet, he demonstrated unwavering faith in God. He said, "Please test your servants for ten days ... then let our appearance be observed in your presence and the appearance of the youths who are eating the king's choice food; and deal with your servants according to what you see" (Dan. 1:12-13). Daniel did what was right, and trusted God for the results, no matter what. In this case, God caused Daniel to look healthier than all the other youths (Dan. 1:15). If it had turned out that Daniel's appearance failed the overseer's scrutiny, I believe he would have trusted God without wavering, maintained an uncompromising lifestyle, and humbly accepted the consequences. I also believe that all true Christians will show the same fortitude in the midst of trials. If you've fallen into a pattern of compromise, confess it as sin to the Lord. Repent and look at Daniel as an example of unwavering integrity. Then seek the Lord's help to live like he did. You must resolutely set your heart as Daniel did to fear the Lord, and the Lord alone. Borrow a little backbone from him, and you'll live your life with integrity before God. The Rapture: The Greatest Event Coming Soon!